This high efficiency semi-flexible 160W (80W + 80W) solar panel kit is perfect for permanent outdoor use to provide free electricity for charging 12V batteries to power various applications, such as in a motorhome, caravan, camper, boat, or for solar lighting systems, off-grid and back up solar power systems. These reinforced semi-flexible solar panels have a unique 7-layer construction, featuring an embedded sheet of anodised aluminium fully encapsulated within each solar panel. This additional reinforcement offers greater strength and resilience, making them amongst the most robust semi-flexible solar panels available on the market. In addition to the aluminium reinforcement, the surface of these 80W semi-flexible solar panels is made of strong ETFE material which has a longer service life compared to standard semi-flexible solar panels. As a result, these particular semi-flexible solar panels are extremely hard-wearing and less prone to cracking , delamination and corrosion. The lightly textured coating of these panels creates an anti-reflective surface which allows the panels to absorb a far greater amount of light, thereby increasing efficiency. ETFE material has long been used in applications where durability and high-temperature resistance is required, such as in the Eden Project, Cornwall. You can read more about ETFE and its benefits here. The high-efficiency monocrystalline German solar cells used in these solar panels have excellent performance in low light conditions (particularly when compared to solar cells of unknown origin) and they produce a good amount of power even in daylight - when direct sunlight is not available. These panels also feature innovative 5 busbar solar cells, which are more efficient than the 2, 3 or 4 busbar solar cells used in most other solar panels, and are able to extract more power from the same surface area. The semi-flexible design of these panels makes them ideal for curved roofs and surfaces where bonding is preferable (though the panels can also be fixed by bolts or screws). 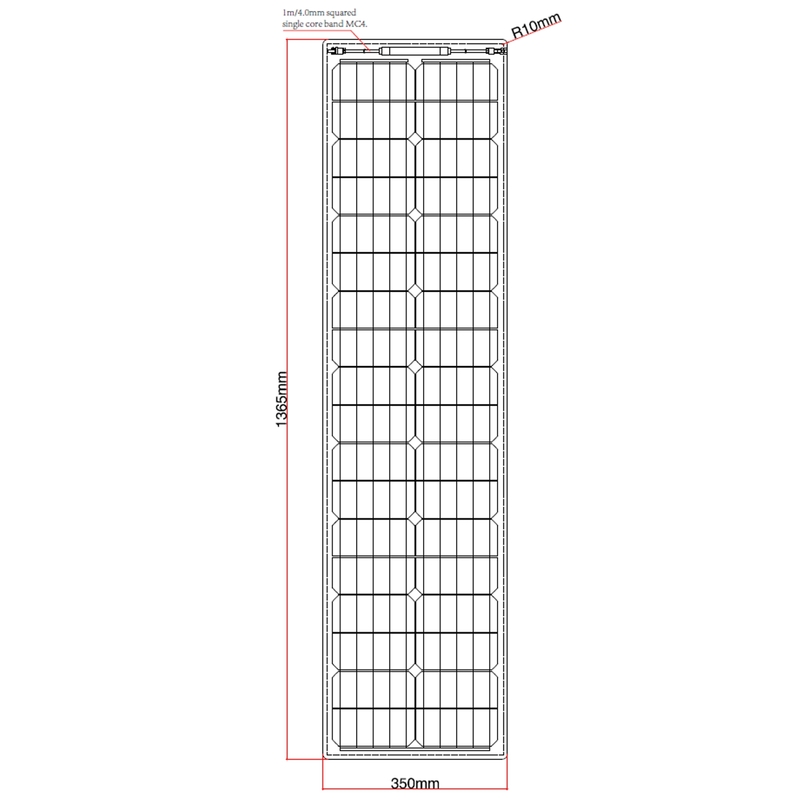 The panels are also incredibly light (only 3.05kg each) which makes them an ideal option for all vehicle applications. The unique narrow design also make them ideal for applications where space is restricted, or where there are obstructions on the roof. The panels are also highly resistant to salt water environments and it is also possible to walk on the panels, making them the perfect choice for boats and yachts. The panels are fitted with 2 x 1m of cable with MC4 connectors on the end. The kit includes a 20A 12V/24V Photonic Universe solar charge controller designed to protect batteries whilst charging them, with automatic cut off to prevent over-charging and deep discharge. The controller uses PWM (Pulse Width Modulation) technology which increases charge acceptance and prolongs the life of your battery. Often PWM technology can recover some lost battery capacity. This controller stops reverse current at night (from the battery back to the solar panel) so your battery won't lose any charge. It has many other protection functions such as over charge / discharge, over load, short circuit, overheating etc. Other features of this controller include LED indicators, temperature sensor, and a load "on/off" button. This controller can work with sealed, gel and flooded batteries (the default is sealed) or a user-defined battery type (please note battery type can only be changed from default using one of the communication methods listed below). The controller can accept up to 320W (12V battery) / 640W (24V battery) of solar power input, which makes it ideal for future systm expansion. The kit includes 5m positive and negative 4.0mm solar extension leads for connecting the solar panels to the solar charge controller, and a 5m 4.0mm dual core battery cable fitted with a 15A fuse, fuse holder and 8mm ring terminals for use between the solar charge controller and your battery, making the total cable length between the solar panels and the battery 1m + 5m + 5m = 11m. A pair of T-branch MC4 connectors is also provided, in order to connect these panels in parallel (Click on the Installation tab for further details). Connection: Please note that it is essential to connect these 2 x 80W narrow panels in parallel (+ to +, - to -), using the T-branch MC4 connectors provided in the kit. Plug the positive (+) leads from both solar panels into the same T-branch adaptor with two "female" input sockets, and both negative (-) leads from the solar panels into the other T-branch adaptor with two "male" input sockets. Then simply plug the two spare solar extension cables into these adaptors and run the cables to the controller, carefully marking the polarity of the extension cables (the cable coming from the two positive leads of the solar panels remains positive). The solar charge controller comes with a detailed instruction manual which explains settings and operation (see Documents tab).